Oh, the reindeer is real! While at the Arctic Circle in Finland, we kept ourselves busy during daytime because waiting for the Northern Lights only happened at night. There were so many things to do although a little bit pricey, and most of the hotels offer these activities. The Reindeer Sleigh Ride was one, and it made me feel like a child at Christmas! Here we are.. at a Sami reindeer herder's farm.. It feels strange because for the past few days, we have been eating reindeer meat. And now, this reindeer is not happy to see us. Time for instructions.. the Sami is showing us how to enjoy the ride. The Sami people are the indigenous people living in some of the Arctic areas of the Scandinavia. Getting comfortable in our sled. The Sami is coming to cover us with our blanket.. which is actually a big patch of reindeer skin. Into the woods we go. There is only one guide, and he is in the first sled. 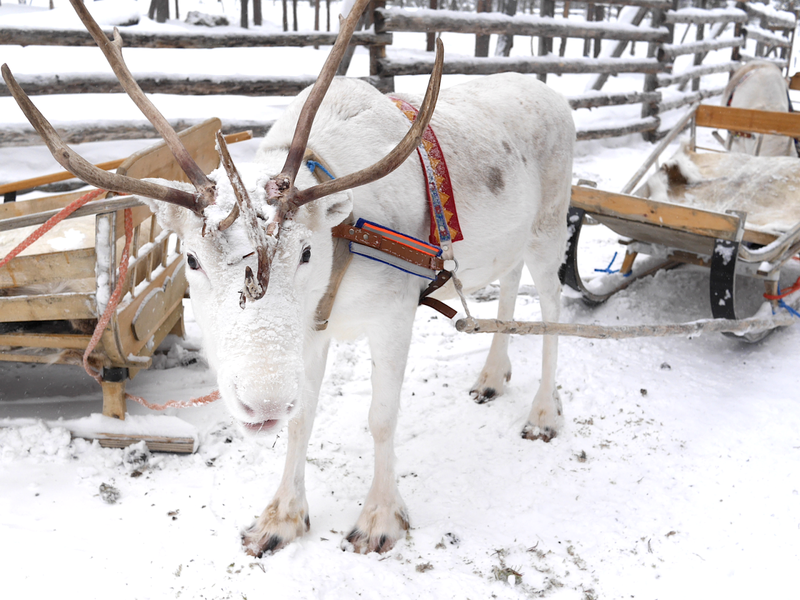 All the reindeer sleds behind are tied to each other, and the reindeer just go with the flow as the ropes pull them. All we have to do is to sit back and relax.. if we can.. because it is ssooooo cold! It is raining ice.. or I think they call it freezing rain. And the blanket is just not enough.. because the wind is blowing, especially on my face! This is the last reindeer sled of the pact..
..and this guy keeps trying to overtake our sled! Finally back at the farm..
For doing a great job.. I am thanking our reindeer with some petting and moss (food). Also check out: Husky Dog Sledding, Northern Lights Over Lake Inari, Medieval Old Town of Tallinn, and First Glimpse of the Arctic Circle. Enjoy! Thank You, Travel Now Magazine!